Flowers… the most tender form of adornment, with their delicate fragrance in the air, their soft, cool touch against the skin and pure colours; the timeless beauty that lives and dies everyday. Flowers truly represent the Sringara Rasa, the emotion of beauty and love, as the ornament of beautiful maidens, fresh blooms of spring and a treasure for bees. Floral hair ornaments complete the ‘solah sringar’, or sixteen ornaments of a bride. Before gold and silver jewelry, it was flowers, leaves and shells that were used by the early humans to for adornment. This ancient tradition of decoration with flowers still exists today, proven by the number of flower sellers near every major place of worship in the cities and towns of India. 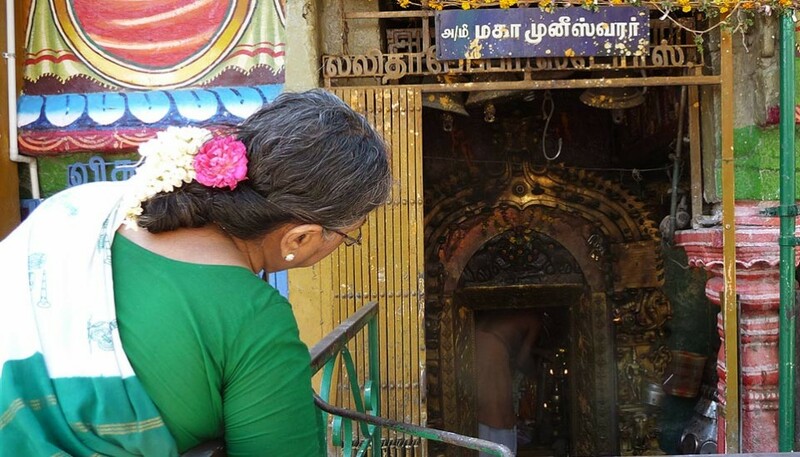 One of the major centres of flower markets is Madurai, the temple city. 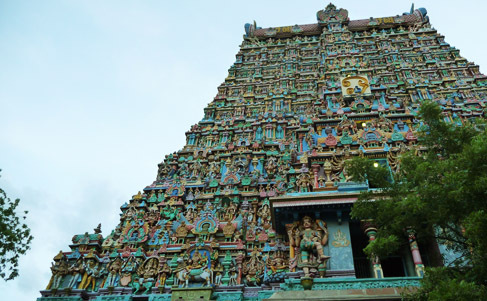 This ancient city in Tamil Nadu, designed around the glorious Meenakshi temple in a lotus shaped plan, was once an important centre for trade with Greece and Rome. It is said that this city of flower markets could be sensed from a distance by Roman travelers, such was the fragrance that spread all around. Things appear to remain almost unchanged over those hundreds of years, as dawn breaks at the temple and the sun’s rays touch the fresh dew of jasmine buds, just a few kilometers away. The bustle of flower sellers starts early in the morning and continues till evening, with flower farmers from nearby villages bringing fresh stock throughout the day. 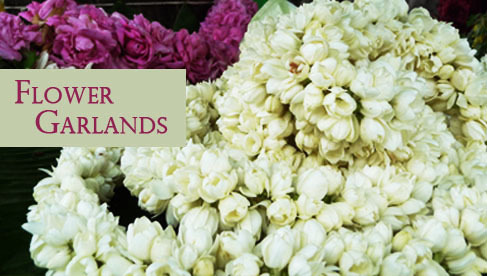 Sometimes compared to a share market, prices of the flowers begin high and drop as the day progresses. Here, the sellers are also craftsmen, who give form to the fragrance. Making flower ornaments from morning till evening, fast fingers braid flowers with fibre in the midst of busy sales. Even before reaching the flower market, a feast for the senses begins. Sweet smells of flowers fill the air, and the energy and noise of vendors and suppliers, customers, bargainers, devotees, and tourists; hums like the buzz of bees. Bright, saturated colours strike the eyes… strong magenta, juicy orange, sunshine yellow, interspersed with pearl whites and fresh greens complement the bright colourful saris of locals. A large variety of flowers amazes the buyer, colourful roses in bunches and loose petals, globular marigolds and round chrysanthemums (sevanti), fragrant jasmine and crossandra (aboli) strung together for hair ornaments, and heaps of delicate white parijat, champa and mogra. Of all these, jasmine (‘Madurai Malli’) is the ubiquitous flower that is used in gajras, offerings for deities, weddings garlands, decoration and perfumes. 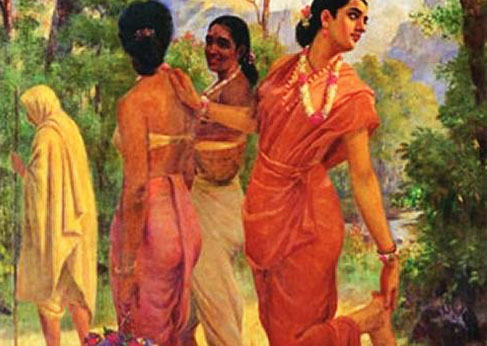 From sacks full of flowers sold in kilos, enormous garlands for deities to dainty gajras for the ladies; there is something to please everyone here. Fragile flowers are strung together one by one, by careful hands, swiftly yet tenderly. Such a frail material requires a delicate touch, yet speed should not be compromised. 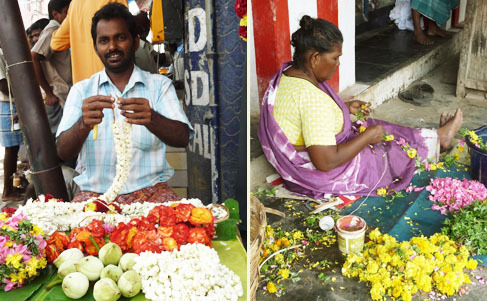 Flower sellers make beautiful garlands bytying them with cotton threads or sometimes by stringing them with needles. Combining different flowers, they make compositions in colour, for garlands used in weddings or offered in the temples. Chains and strings in different patterns are made by their practiced nimble fingers. Sometimes they use strips cut from the bark of banana trees instead of thread to tie the flowers into chains. Ancient humans must have used such material to make their floral ornaments before they had invented the thread. This primitive form of decoration is even today, inseparable from any significant event in a person’s life. 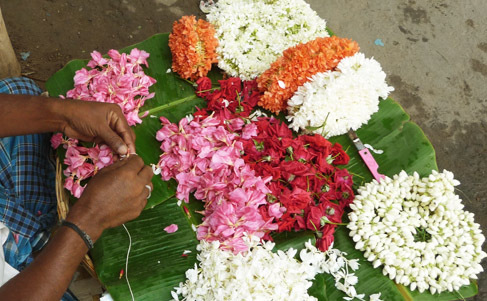 From the celebration of birth to mourning of death, complimenting festivals and weddings, a lover’s gift or a devotee’s offering, the garland maker touches lives with the fragrance of flowers.